For a change, at least outwardly, the world really was shocked when Mahmoud Ahmadinejad (may he go to hell soon, amen), said, “Israel must be wiped off the map” (G-d forbid). 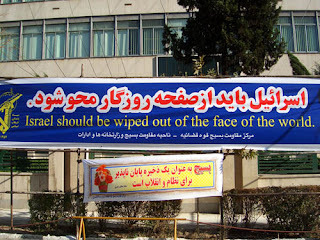 But soon afterward, an American university professor named Juan Cole (a Baha’i, but one who has chosen to be on the wrong side of history, and to side with those who persecute his brethren—contrast Carridine of LGF) called it a mistranslation, saying Ahmadinejad was speaking of Israel “vanishing from the page of time” (G-d forbid). The world then relaxed, having been saved from what could have been a repeat of the Mokusatsu Affair (reputedly the mistranslation from Japanese that drove the USA to decide to drop the atom bombs). Lots of things have existed! Lots of things have existed; Soviet Union, Apartheid, Slavery, segregation, etc. That does not mean that they will continue to exist. They had their time and are now gone. There are few tears shed. Israel is a country that discriminates against people because of their religion and ethnic origin. Systems based on maintaining the supremacy of one group over another will never be at peace. Israel can gain peace by becoming a country of equal rights. The alternative is to join that list above. You're no more interested in civil discourse than you have accused umkahlil and sabbah. And you squandered whatever opportunity you had with not one, but TWO Palestinians to have some kind of dialogue, to reach some kind of understanding, even if you in the end disagreed. No, you chose to stalk them. And attack them. You were never interested in their views. You see one-state as destroying Israel, yes? You realize this comes across as racist, right? But you can't say that can you? Therefore you label these two your ENEMY and you actually believe this hatefulness would be productive to understanding each other? The above comment was in response to “another American”, referring to his calling “Palestinian” commenter “umkahlil” his enemy for advocating the one-state solution. These two samples from what passes as perfectly acceptable for “progressive” thought today show that the world has no problem with Ahmadinejad’s statement assuming Juan Cole’s translation. Following on such figures as Jimmy “Too Many Jews” Carter and Desmond Tutu, the “voices of reason” on the Left think advocating the end of Zionism is totally, essentially, entirely, unbridgeably different from calling for a nuclear attack on Israel (G-d forbid). And we have in this a warning: should the leaders of Israel be so insane as to have reached the situation where the next pound of flesh demanded of Israel is the application of the “Palestinian Right of Return”, any opposition to that demand would be decried as racism. The very concept of Israel as being a Jewish state, with a Jewish majority, is already being condemned as racism. This is the sign of the worse to come. There are answers to this charge, some of them made by commenters on those very Daily Kos diaries: that “Israel as a Jewish state” is no more racist than “Ireland as an Irish state”, for example. The exchange of these comments and their rejoinders is the usual invective of the Daily Kos I/“P” diaries, which has gotten so bad that even the admins woke up to it and had to do something. But I am interested in taking a different route, the route of arguing that, with such adversaries as we have, we have no choice but insist on a Jewish majority, even if such a thing were racist. We judge the other side by their words and by their deeds. The words need to be checked against the deeds, because—contrary to the faith of the paper-worshipers—human beings, even non-Western, indigenous “noble savages” like the “Palestinians”, are still capable of lying. Hamas are better than Fatah in that regard, in that they are more honest than Fatah in voicing out their true intentions of Jewish genocide (G-d forbid), but the Leftists are wont to latch onto the feeblest words of peace, the thinnest straws of an apparent olive branch, and say, “Look, they support a negotiated peace with Israel! Israel has an obligation to go with that”, and then condemn Israel for its “hardlining” when it has to respond forcefully to suicide bombers and Kassam rockets, the deeds that expose the truth of what resides inside the the other side’s hearts. So far, it is possible for our “Progressive” friends to chalk it all up to “resistance against the occupation”. But there is one thing that cannot, in any way, in any wise, by any context, with any excuse, be explained away as “resistance”, and that is the education of their children. It is because of the absolute strength of that point that the “progressives” take such pains to either brush it off as mistranslation (looks like a recurring theme now…) or as frivolity, claiming it is a distraction from the real issues of “the occupation, Israeli brutality” et cetera (from that link: “Every day Palestinian children face the reality and brutality of occupation. Does anyone really believe that it takes propaganda to teach Palestinian children to hate the occupiers?”). As far as the question of translation goes, that’s beyond my ken; the charge of frivolity, in contrast, is at the center of my mode of writing, because it concerns the role of ideology in shaping events. To this I now go. The children in the “Palestinian Authority” (oxymoron) are being taught to hate the Jews, to nurture that hatred and to preserve it until the moment of action (G-d forbid). Their education is, in essence, no different from Nazi education, that which resulted in the Holocaust. This education, despite the attempts of certain moral equivalators to show otherwise, has no parallel among the Jews. I wasn’t brought up on hating the other side; on the contrary, I went through a school program teaching me that the Arabs were the same as me, just with a different culture. That I hold the positions I hold now is cause-based, not indoctrinated, and that is true for countless Israeli Jews. There is no frivolity whatever in the education of children, and great will be the downfall of whoever takes this issue lightly. G-d says: “[…] ask thy father, and he will declare unto thee, thine elders, and they will tell thee.” (Deuteronomy 32:7); ask the elders, those Zionist pioneers who came to the Land of Israel from any period between 1870 and 1947, or just read their history if they have gone away to their world, and they will tell you it is possible for a peaceful and friendly life of decades alongside the Muslims to be followed, all of a sudden, by being murdered by them (G-d forbid). How is that possible? The wisest of all humankind, King Solomon, answers: “Train up a child in the way he should go, and even when he is old, he will not depart from it.” (Proverbs 22:6). The teen may rebel against his parents, and live his own life turning his back on their teachings, but they are etched onto his brain, and one day, by some unknown, unforeseen trigger, they can spring back into action. That is the root cause of Sudden Jihad Syndrome, in which a “good boy, who would never hurt a fly”, one day goes on a suicide-terrorism mission (G-d forbid). The education of “Palestinian” children, as does the education of Muslim children in general, ensures that there will never be peace, no matter how generous the concessions made. It may be after decades of peace, of being bosom friends, but one day that childhood education will rise anew, at some unexpected incident (could be as petty as a bunch of cartoons), and then the old training, those words “Kill the infidels wherever they are!” that were inculcated into those minds when they were soft and receptive, will make it as if all the negotiations, concessions and treaties had never been held, made and signed. 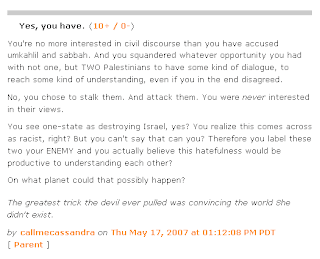 One good thing I learned from reading the diaries and comments on Daily Kos: if there’s an issue that the posters there (even the pro-Israel ones) insist on ignoring, then it means that issue is all-important. Even the saner denizens of Daily Kos are beholden to the basic premises of historical materialism, to the view that addressing the material grievances will do away with all the hatred; therefore, those ideological points that they insist on writing off as “frivolities” are exactly the ones that are crucial to this conflict—the ones which, unless solved, will guarantee the continuation of bloodshed in perpetuity. The only surviving child of Walt Disney has called Hamas “pure evil” for using Mickey Mouse to teach islamic radicalism to children. Diane Disney Miller said she was disgusted that a rip-off of her father’s iconic cartoon character was being used on a new Hamas TV show to encourage Palestinian children to take up arms against Israel and America. “Of course I feel personal about Mickey Mouse, but it could be Barney as well,” Ms Miller, 73, told the New York Daily News. “It’s not just Mickey, it’s indoctrinating children like this, teaching them to be evil,” said Ms Miller, who owns a winery in northern California. Just so. There is no context that can excuse such a thing. “Resistance to occupation” can involve many things, but this is not one of them. Teaching kids to hate the other side for posterity is not resistance any way you slice it, although some think otherwise. The blood of those children is on the hands of whoever dismisses their education as “frivolity” or “preaching resistance”. What will be wiped out from the page of time, by the hand of G-d Himself, is this unmitigated evil, speedily in our days, amen. Cowardice rears its pathetic head. People attack Israel for the same reason they attack the US, it's risk free. There are no consequences. You get to feel brave free of charge. The landscape is littered with dead Russian journalists who dared to expose government corruption. No one talks about Theo van Gogh, but his murder informs every published commentary and haunts the dreams of every movie director. But be assured, if the same people who villify Israel and the US ever felt the enemy breathing down their necks, they would scream louder than any one for military pre-emption. I've seen it before. The bravest people in the world are Muslim (and ex-Muslim) women who publicly take uncompromising stands against the abuses of Muslim societies. They are volunteering for execution, and they know it. as an example of ongoing anti-Semitism at Daily Kos. Darfur is the best example of both points you make. A few months ago, there was a post on Jihad Watch on a reporter who was beheaded there. The moonbats' courage goes only so far as their prospect of keeping their behinds unscathed. On the other hand, those same people have been calling for the US government (the dreaded, Bushitler-controlled Establishment, no less!) to do something about Darfur. Do what about Darfur? Invade and occupy, the same thing they're screaming about now concerning Iraq? If the USA were to pitch in with its military to help, then it is inevitable that the insurgency would start there too after a few months. Other than the hypocritical call for US intervention in Darfur, all you hear from the Kossacks about it is mere platitudes like, "We must save Darfur! ", which is no different from, and equally effective as, the old "Free Tibet". One of the Kossacks, Keith Moon, has this on his sig: "FREE TIBET! Bang the Drum! FREE TIBET! Boom! Boom!" He's a pro-Israel Kossack too. A very unusual figure in Daily Kos--far too independent-minded for that site. Anyway, the Darfur diaries differ from the Israel/"Palestine" ones in two ways: 1) far less frequent; 2) far less acrimonious. It is my conviction that this is both because of the near-lack of danger in Israel activism, as you said, and also because Darfur isn't an area where they think US activity is bringing the wrath of the Muslim world upon them. All about self-interest, pure and simple, no ideals whatsoever. "Have we really reached the point that 'Zionsm is racism' is an applauded theme, and the wish for te end of the Jewish State a laudable goal, here on Daily Kos?" The answer is yes. And that's the reason for my seeming obsession with Daily Kos: it demonstrates the mainstreaming of those sentiments on the Western Left. I do not refute so much as expose and warn. You mentioned, and quoted, Disney's daughter in your post. I wonder if the Disney family or corporation could sue Hamas for copyright infringement, to get their jihad mouse of the air? Not that it would work, but it would at least get a court to the spade a spade. This idea has been raised, sometimes seriously, sometimes humorously, on the blogosphere ever since Hamas Mouse first went on air. Humorously as in, "Disney's army of corporate lawyers can do to Hamas what thousands of guns, tanks and airplane can't do; they'll surrender before you know it". It seems dhimmitude strikes again, when you compare Disney's lack of reaction so far (Diane Disney Miller's comment is unofficial) to their swift application of aforementioned army of corporate lawyers in other cases. Either that or the wait is for preparing something big, but I wouldn't count on it. As the anonymous commenter said, "Cowardice rears its pathetic head".